More than 16 percent of Americans, one in five children, live in poverty in the U.S. While the needs of children in countries like India and Ethiopia have long been considered in our missions programs, it may seem more baffling for your church to know what to do about the poor in your own backyard. Changing demographics and the migration of poor people displaced by urban gentrification will undoubtedly present a dilemma for your congregation soon if it has not already. 1. Develop a theological framework about poverty. If your congregation has been relatively socioeconomically homogeneous and isolated from the effects of poverty you have likely developed a theological frame of reference that has excluded large portions of Scripture that address issues of poverty. I recommend books like Rich Sterns’ Hole in the Gospel, or my own Bible study guides Compassion and Justice, to gain a deeper understanding of God’s heart for the poor. 2. Organize groups from your church to volunteer at local ministry organizations that specialize in working with people on the margins. Luke 4:18-19, Isaiah 58:6-12 and Matthew 25:31-46 provide virtual lists of places to serve: ministries that feed the hungry, visit prisoners, build housing, provide clothing and shelter for “the poor wanderer,” etc. Discover those who are already doing this work in your city and join them. When the Samaritan man crossed the road and went to where the mugged man was, he was “moved with compassion.” Nothing will move your church toward compassion more than coming alongside the broken and experiencing their distress through authentic relationships. 3. 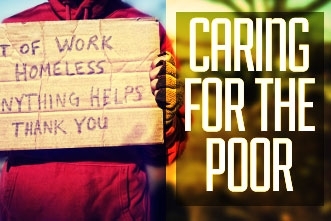 Make care for the poor a spiritual discipline. The evangelical church has been great about teaching the disciplines of fasting, prayer, Bible study and church attendance. I suggest that we consider habitual care for the poor as another important discipline, that we make it a routine part of our Christian life and practice. I have seen the faith of nominal Christians come alive when they have engaged with the men and women in our shelters at Breakthrough. The poor have so much to teach us as we come to recognize our own poverty and are inspired by the faith of those who pray to God for their daily bread and really mean it. Care for the poor is not a burden; it is a gateway to vibrant Christian faith and robust congregational life. The picture painted in Isaiah 58 is beautiful. Next articleFree Graphics Package: "Road Trip"
Arloa Sutter is the founder and visionary leader of Breakthrough Urban Ministries in Chicago (BreakThrough.org). Arloa is a graduate of Moody Bible Institute and Western Illinois University and received an MA in Urban Mission from Lincoln Christian University and a Doctorate of Ministry degree from the Bakke Graduate University. She is on staff at the River City Community Church.